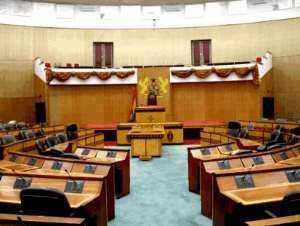 ..nothing but a rubber stamp for executive The out-going Member of Parliament for Hohoe South, Kosi Kedem has criticized the legislature of being nothing but a rubber stamp for the executive. He said the House has failed to perform to satisfaction. Mr. Kedem who voluntarily decided not to contest the Hohoe South seat for the fourth time on the ticket of the opposition National Democratic Congress (NDC) told his colleagues in parliament in what he called his “valedictory statement” that the honeymoon is over. He said after 12 years of existence and so much of constitutional powers at its disposal, the public will not be in any mood to accept any further excuses for the inability of the august House to perform its constitutionally mandated functions satisfactorily. Mr. Kedem told this reporter that he is particularly disappointed at the work of the House and does not feel challenged enough to continue as an MP, hence his decision to give way to a fresh limb and contribute in another capacity in the building of the country's democracy. “So many things play into the hands of the executive. Anything the Executive brings to the floor of the House, whether it is in the national interest or not, it is passed even if there's protestation from the minority. The presidency, from 1993 has been allowed to do what it wants, in fact, it has overplayed its executive power card,” the man regarded by his colleagues as a very experienced Member of the House told this reporter. Kedem who is also the NDC's spokesman on Education lamented the extreme polarization of the House, saying even good ideas coming from the opposition are not necessarily accepted because it is coming from that side of the House. He was critical of some of the appointments and loan agreements that are brought before the House. “If we are to scrutinize carefully these appointments and agreements, some of them would have been rejected." Even some Members from the majority would have voted against them if they were put to secret voting. “Budgets are discussed in a cursory manner; sometimes we do not even know the actuals of the previous budget, but we pass the current one,” Mr. Kedem lamented. He further pointed to the failure of the president to set up a commission to determine the salaries and remunerations of MPs, the Speaker and others, “saying in this sort of atmosphere where even the basic constitutional provisions are not given much regard, what are you going to stay in parliament here to do?” Apart from having the opportunity to stand up and talk, what else? The outgoing MP reminded his colleagues in the in-coming parliament of the challenges facing them as the perception that parliament is weak in relation to the executive gains root.